Florida, USA. July 15, 2017: Dr. Buzz Aldrin tonight rolled out a ‘red carpet for the red planet’ at an exciting event to commemorate 48 years since Apollo 11’s Moon landing, and to countdown to the Apollo 11 50th Anniversary in July, 2019. Held under the historic Apollo Saturn V rocket at the Kennedy Space Center, the unique event featured rare appearances, speeches and on-stage conversations between some of the most famous US astronauts and space industry innovators. Aldrin, the Lunar Module Pilot on Apollo 11 and one of only 12 moonwalkers, was joined on stage by Gen. Michael Collins, Command Module Pilot for Apollo 11, in a rare public appearance. Other astronauts included Walt Cunningham (Apollo 7), Harrison ‘Jack’ Schmitt (Apollo 17), Mae Jemison (the first African-American woman to travel to space) and Terry Virts (Space Shuttle Endeavour pilot in 2010 who also spent 200 days on the ISS in 2015). The event was held at Kennedy Space Center, the historic launch site of all the Apollo missions which is now the launch site for SpaceX, ULA and the future launch site for Blue Origin. At the event, Aldrin oversaw the auctioning of some unique auction lots donated from pioneers in the worlds of space, polar and aviation exploration. Highly collectible memorabilia included a First Day Cover signed by all three Apollo 11 Crew members, flown to the surface of the Moon, a signed, framed sample of Kapton foil from the Apollo 11 Command Module, and a signed, boxed OMEGA Speedmaster ‘Moonwatch’. Significant funds were raised to inspire and enable future generations to make scientific advancements that will lead to humans living on Mars, $57,838 from a silent auction and $134,950 from the live auction. A surprise guest was Jeff Bezos, founder of Amazon.com and spaceflight company Blue Origin, who accepted the first annual Buzz Aldrin Space Innovation Award. His company has been perfecting reusable rockets and will soon take tourists on sub-orbital flights. Jim Christensen, Director of Education at the Kennedy Space Center Visitor Complex, collected the Buzz Aldrin Space Education Award while Mae Jemison accepted the Buzz Aldrin Space Pioneering Award. The glass awards were produced by the Soneva Resorts’ Glass Art Studio in the Maldives. 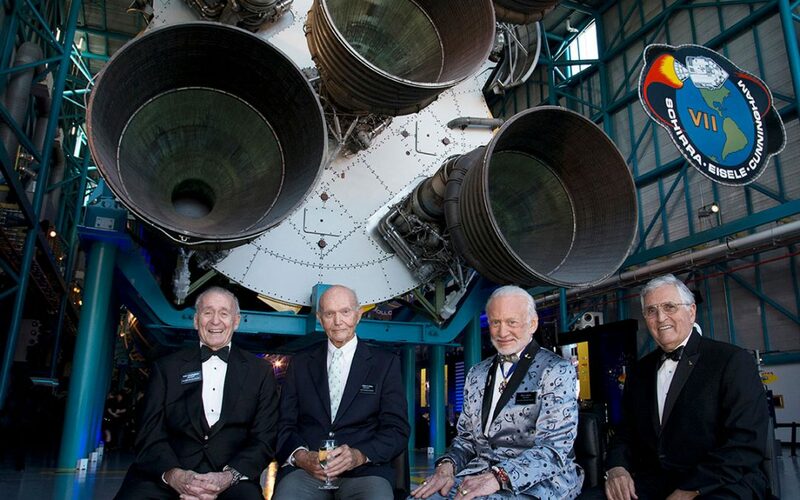 The Apollo 11 gala event is the first part of an ambitious three-year fund-raising campaign devised by the ShareSpace Foundation, culminating in the summer of 2019 with a wealth of global activities to coincide with the 50th Anniversary of the first Moon landing. The foundation is committed to driving education in Science, Technology, Engineering, Arts and Math (STEAM) by providing unique and inspirational learning tools. In the past year the foundation gifted 100 Giant Mars Maps all over the US and some internationally to schools and education centers, enabling students to discover Mars first hand via an interactive floor map depicting the topography of Mars, as well as the landing locations of NASA’s Mars robots. The Foundation has global ambitions in the coming year.